For additional information about this book, visit the website www.thebestofourlives.com. Are you ready for the best of YOUR life? Have you wondered what you want to be when you retire? Where you want to live? And how to do it all? 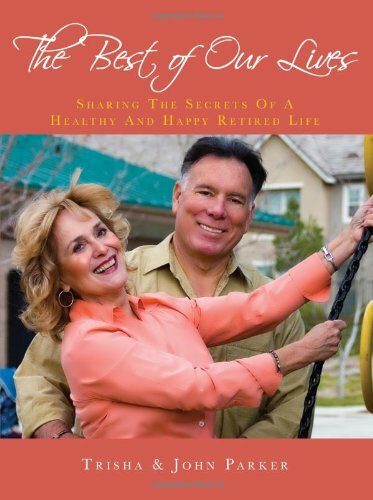 In The Best of Our Lives: Sharing the Secrets of a Healthy and Happy Retired Life, authors Trisha and John Parker, a married couple going through the retirement process themselves, present current research, expert advice, and personal insights into the joys and challenges of retired life. The Parkers provide useful professional recommendations along with their unique solutions, suggestions, and experiences regarding topics such as managing retirement finances, attaining mental and physical health, planning budget travel, starting second careers, and making a home safe for the retirement years. Several helpful original checklists and forms are included to assist the reader in making an informed and painless transition to retired life. Written in an honest and conversational style, The Best of Our Lives reflects the authors' passion for life, family, and friends. Trisha Parker - Married for thirty-nine years, Trisha is an accomplished chef, seamstress, home decorator, and fitness enthusiast. She is most proud of her three sons, three daughters-in-law, and four grandchildren. She loves spending time with her family and is an avid travel adventurer, shopper, and bargain hunter. She is also a spiritual person and enjoys working on a variety of charitable projects. Most of all, Trisha is bright, beautiful, cheerful, and fun loving. John Parker - Over the course of his career, John served on the faculties of several major institutions. He also spent considerable time in the business world and was a founding partner in a successful management consulting firm that continues to operate to this day. As a management consultant and personal advisor, John has worked for numerous legal, corporate, and governmental organizations. He has also been a featured speaker for numerous organizations and a guest on several radio and television programs. John is a devoted family man and enjoys sports, traveling, music, and photography.